For self-storage owners and investors trying to estimate the value of their property, a realistic understanding of an appropriate capitalization (cap) rate is crucial. 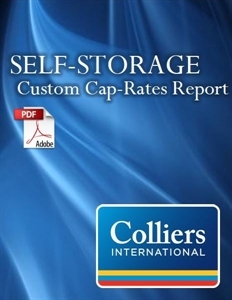 The Self-Storage Custom Cap-Rates Report, prepared on demand by Colliers International Valuation and Advisory Services LLC, addresses applicable cap rates for specific properties and regions using the Colliers Rating System. Based on a specific U.S. address supplied by the customer, the report analyzes comparable self-storage assets within the region as well as applicable cap rates by using eight performance and property metrics to rate a facility as class A, B or C.
Colliers International Valuation and Advisory Services is a division of Colliers International Group Inc., a global commercial real estate services firm employing more than 16,000 professionals across 554 offices in 66 countries. The company offers a variety of services for investors, business owners and developers. These include consulting, market research, real estate intermediation for sale and rent, mortgage lending assistance, project management, property management, and valuation. IMPORTANT:The Self-Storage Custom Cap-Rates Report is generated on demand based on a physical address provided by the customer. The property address submitted for the report may be different from the billing or mailing address on your ISS Store account. In the boxes at the top of the page, please provide the complete, accurate physical address and other requested attributes on which the report should be based. Please allow up to three business days for delivery of the report to your e-mail inbox.